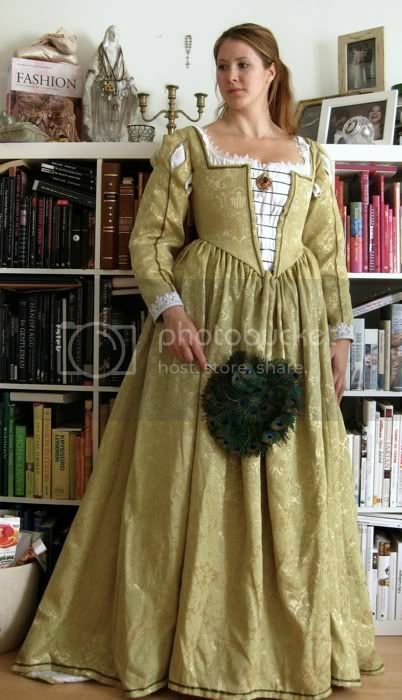 In 2003-04 droolable and gorgeous Venetian courtesan dresses appeared all over the internet. I was jealous. Very jealous. I wanted to make one. But I couldn't for my bare life find a suitable fabric in my hometown (or surrounding areas, for that matter). I made a bodice mock-up, but that was it. Until an interior store got lots of symmetrical pomegranat patterned brocades. It happened over night, and they were gorgeous, and affordable too! I fell for a soft golden greenish one, because I love green and because it reminded me of the light in Venice. The fabrics disappeared just as quickly as they popped up, so I'm glad I got a hold of one. The bad thing about being "last" in making a Venetian dress is that all the snazzy details I fancied had already be dealt with by other costume makers. The cutwork sleeves, the funky shoulder decorations, the grand veils and the various fans. And I wanted to be innovative and original. But alas....! 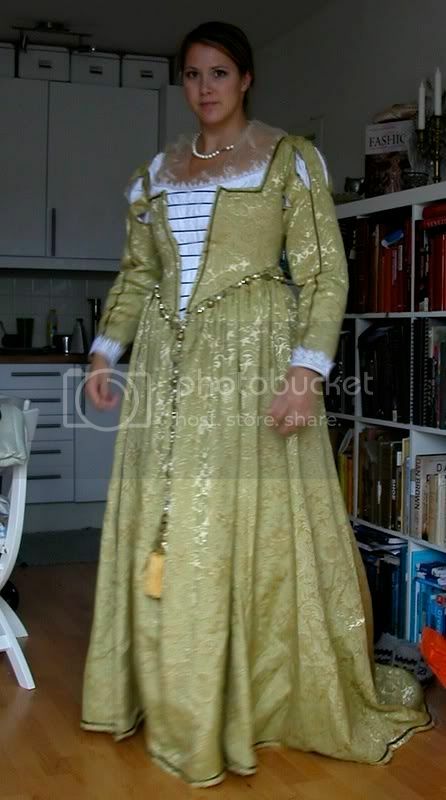 I couldn't think of any ways to make my dress outstandingly original. So I've choosen the plain route. The general inspiration came from a Vecellio woodcut, showing the backside of a brocaded dress with a V bodice back. 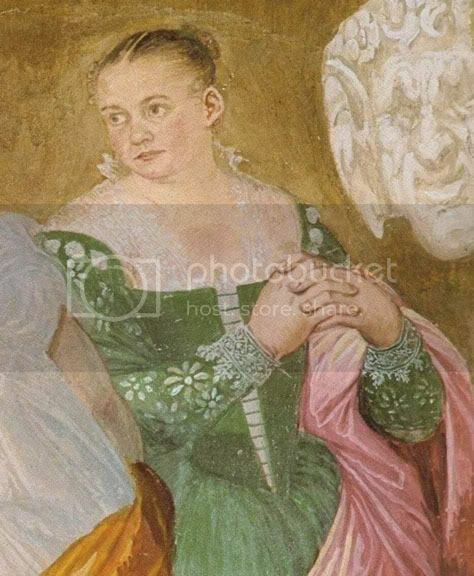 Other pictures of inspiration is that of the (assumed) lady of the house from Villa Barbaro in Maser: in an illusionistic roof fresco a young woman in a blue dress is looking down to the viewers. 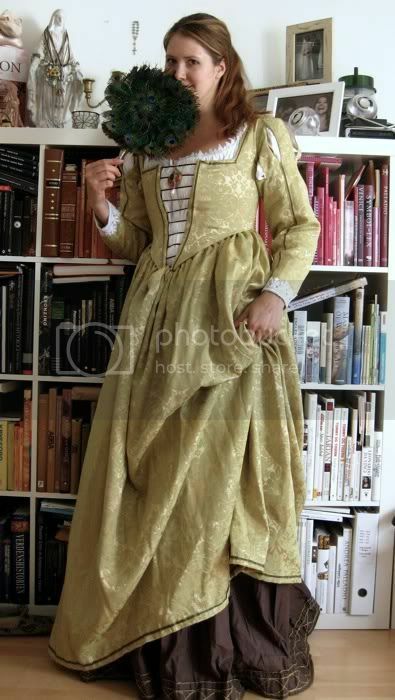 Her dress has a small, curved bodice, a bit unusual compared to the rigourous Venetian bodices usually seen. The dress also shows cutwork sleeves, with shoulder slashes revealing the chemise. I like the overall feeling of that dress, and although I wasn't heading for cutwork sleeves, I fancied the slashes in the upper sleeve/shoulder area. Other inspirations included the trims seen in a carnival group depictured by Paolo Flammingo, and a woodcut of a newly wed noblewoman. 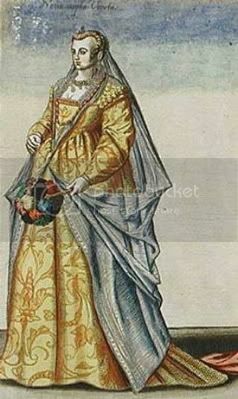 The typical Venetian dress of the mid and late 16th century had a stiff bodice with a pointed, V-shaped opening. 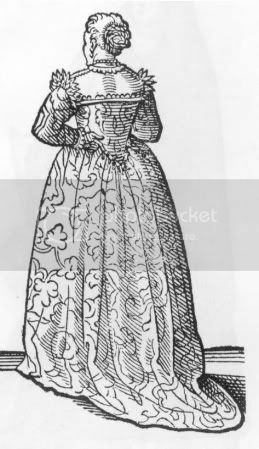 The same pointed shape was repeated in the back, while the bodice usually was short in the sides. The opening in front revealed the white chemise, or sometimes also a decorated modesty panel. There is almost always ladder lacing in front, and the shoulder straps are set wide. There's usually nice shoulder details on the sleeves, and the skirts are high up in the waist, full, and sometimes with a train. The counter-reformation was never embraced in Venice as it was in other Italian city states, and the clothes reflect that. 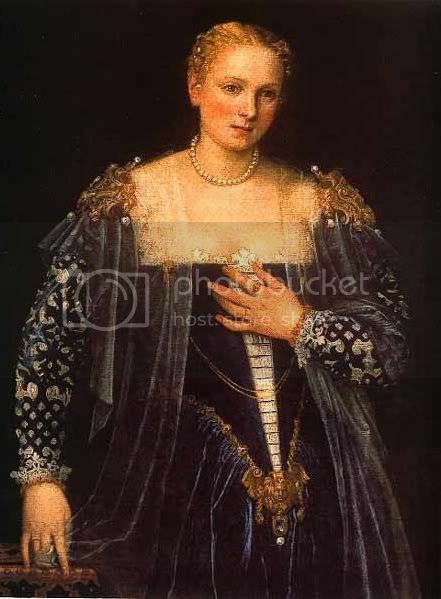 The square, open neck lining typical for all of Italy in the early 1500's lived much longer in Venice than elsewhere, and bright colours and rich fabrics was always in vogue. 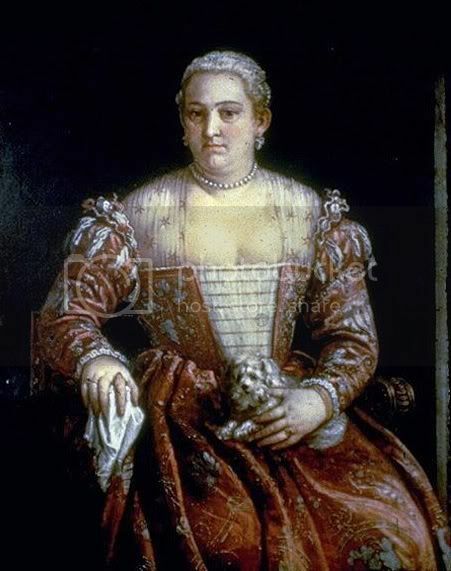 The lace industry was important to Venice, and that is also reflected in the fashion of the era. 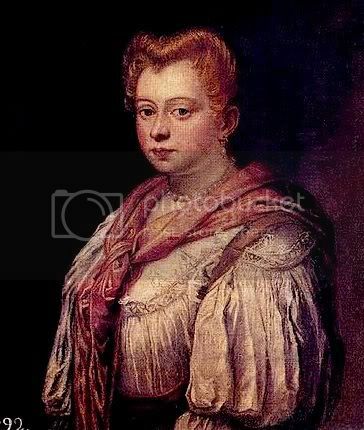 Lace cuffs, collars, shoulder decorations and partlets is a common sight in portraits from the Veneto. 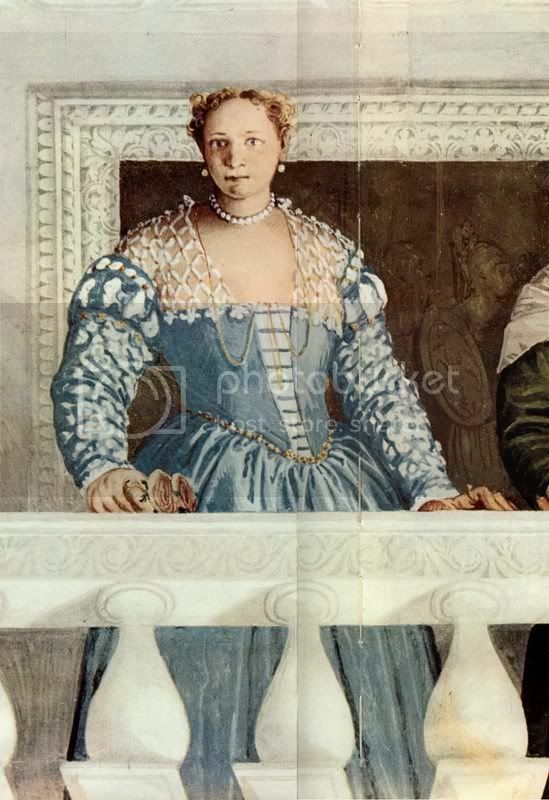 This might have influenced a sleeve decoration common in Venice: the cutwork sleeves, an almost lace like pattern being cut into fabrics, revealing the chemise. 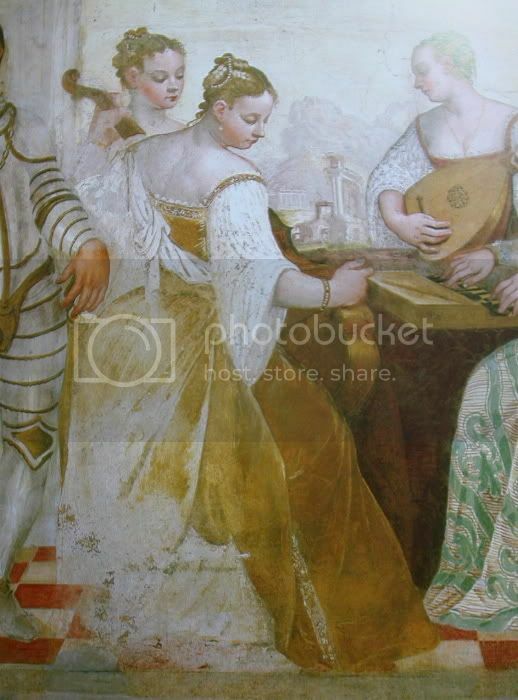 They do occur elsewhere, but not nearly as often as in Venetian paintings. 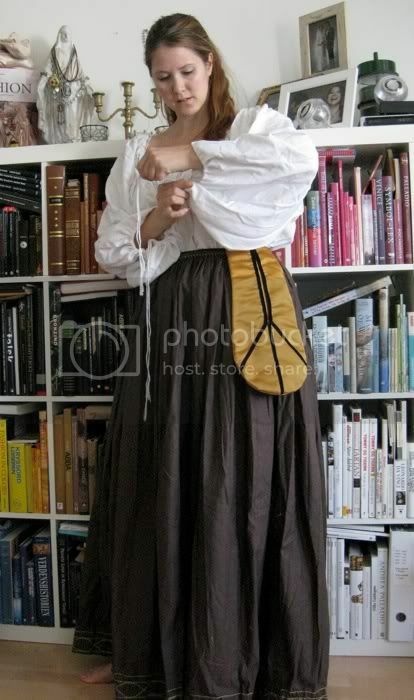 I used a double layer of unbleached cotton for the bodice lining, with boning channels and rigilene, while the skirt and sleeves are lined with a poly satin.The bodice consists of three panels, one in the back and two in front/side. The bodice is front laced in ladder style. 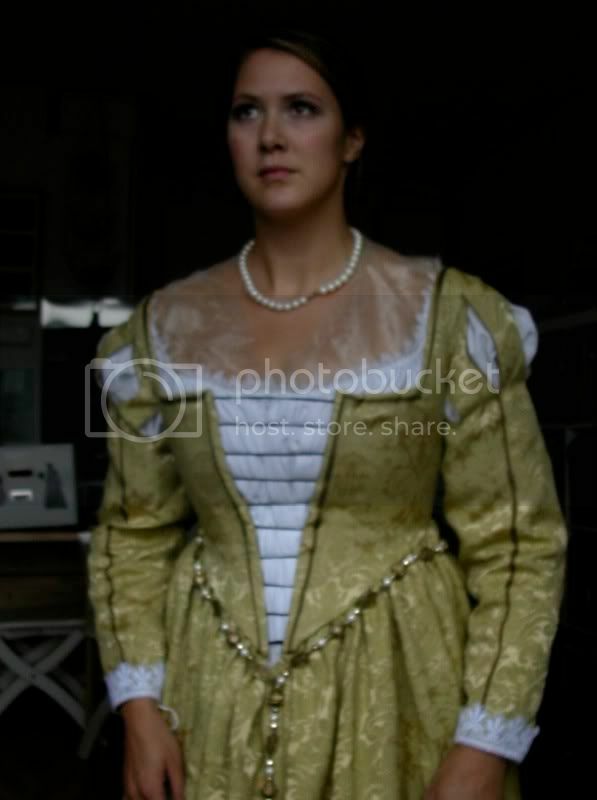 The bodice is pointed in front and in behind, while the sides are raised slightly over my natural waistline. The skirt is also a three-pieced affaire, of large triangular panels, and in the back I've constructed a small train, similar to the Vecellio woodcut. The dress is trimmed with a faded green ribbon with golden edges. I've used the ribbon on the bodice, on the sleeves and around the hem. 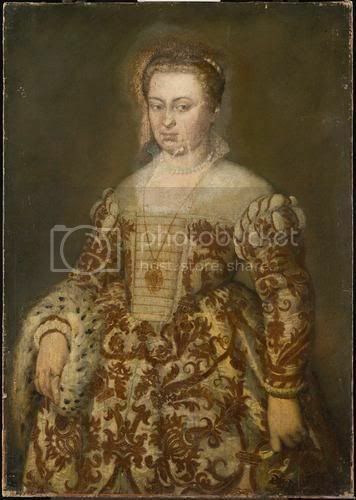 I didn't think Venetian ladies were too crazy about ribbon trims on their dresses, but a quick look at period portraits prooved me wrong. 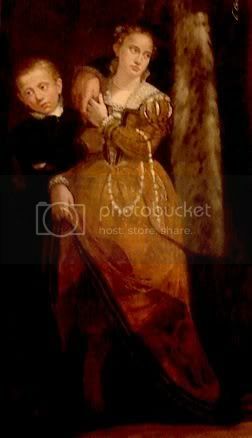 It occurs a lot in the mid and late 16th century. 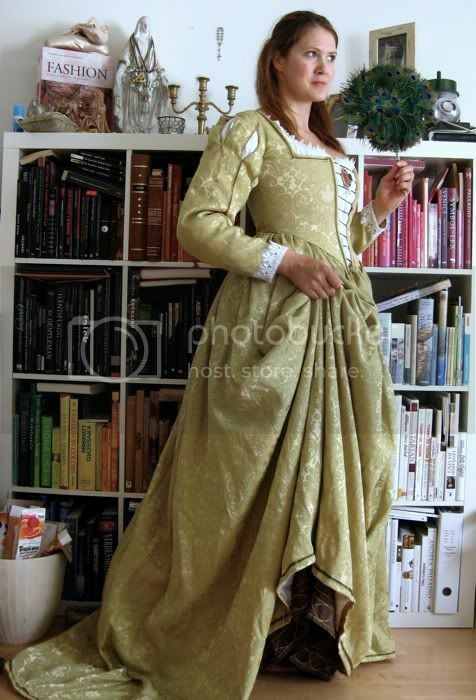 Originally I planned to add two rows of trims, but when I pinned them on, it looked too much like Florentine fashion. So I decided to stick to one, and I think it looks better. Maybe it was my trim, I dunno. The bodice became slightly too short and curvy for my taste. I have enough fabric for another one, so maybe I'll re-do that part. Otherwise I love this dress. It's comfortable, the colour and fabric is very lush, and it has a nice train. The golden girdle was originally made for another dress, but is the perfect match for the Venetian one. The sleeves are made of one piece, with a curve at the top. Each sleeve has 8 slashes at the shoulder, to allow the chemise to poke through. At first I thought about making tabs, and attach the sleeves to the bodice with these. 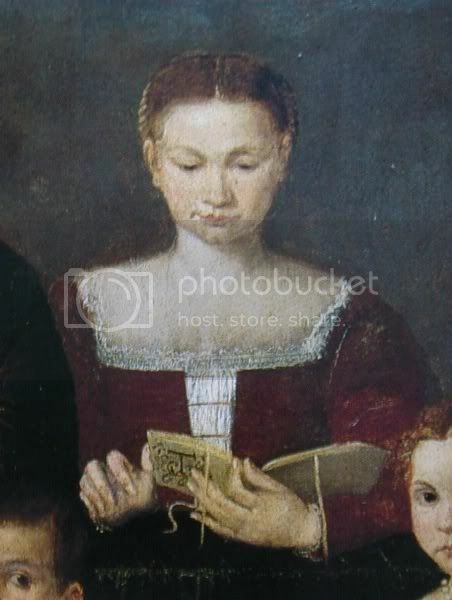 But when studying period portraits I got the impression slashing the actual sleeve was just as common. Mine is modeled after the first portrait underneath. It's quite similar to the others, but the sleeve appears to be directly attached to the bodice. 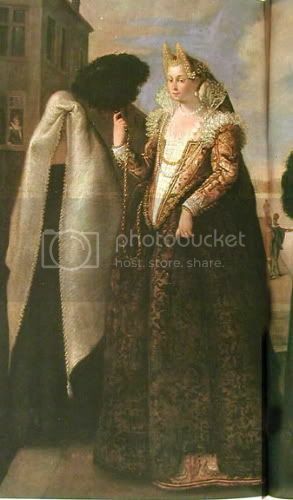 The other later dresses have various "shoulder decorations" between the shoulder strap and the sleeve. Latest addition is the chemise. It's made of a semi-thick linen, and trimmed with gorgeous Vicentine lace. I followed the "simple Italian camicia" instructions of Jennifer Thompson, and it worked like a dream. I had to make the sleeves a bit narrower because of lack of fabric, but it turned out well. The cuffs are wide, but can be gathered by pulling the braided white cotton/linen thread I braided myself. 6. My linen chemise with lace trim in the neck opening. 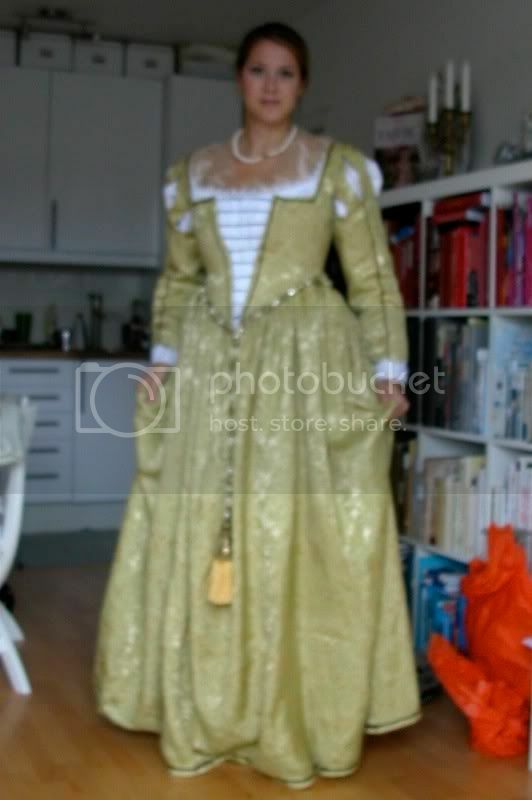 I use multiple layers when dressing in my Venetian dress. The layer closest to the skin is the chemise, which is thrown into the washing machine every now and then. Over that an underskirt with stiffened hem. Over that again the main dress, ladder laced in front. I also wear knee length stockings and garters. 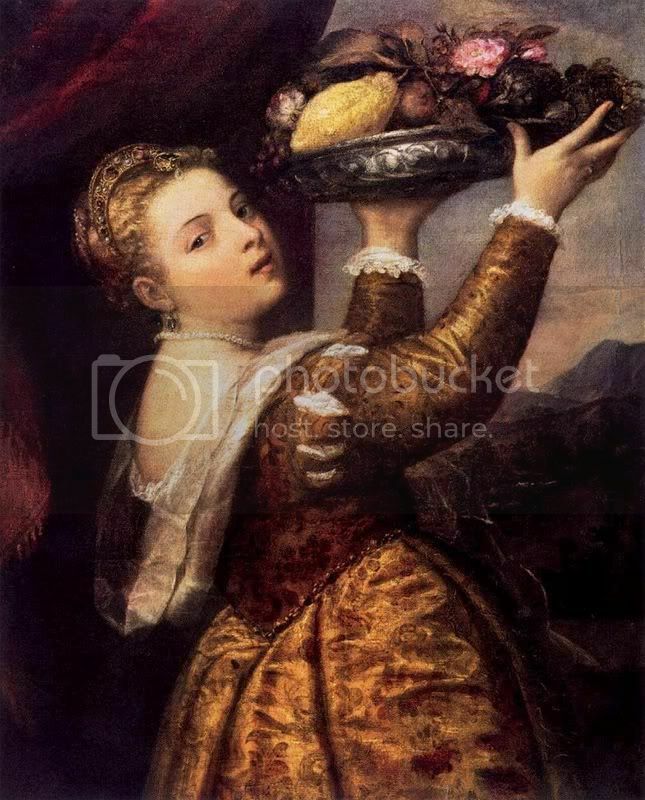 Accessories includes velvet shoes with straps, various large "gold" jewelry with "gems", pearls, a gold or bead girdle in the waist, and a feather fan for the summer or velvet/fur muff for the winter. Though this dress has no side opening in the skirt, I sometimes wear a saccoccia (loose pocket) underneath, to be able to carry my valuables without having to carry a purse.